Garrett on Cowboys' First Padded Practice: "It Was Sloppy"
The Dallas Cowboys had their first padded practice of training camp on Saturday, and it didn’t look great. At least, not according to head coach Jason Garrett. 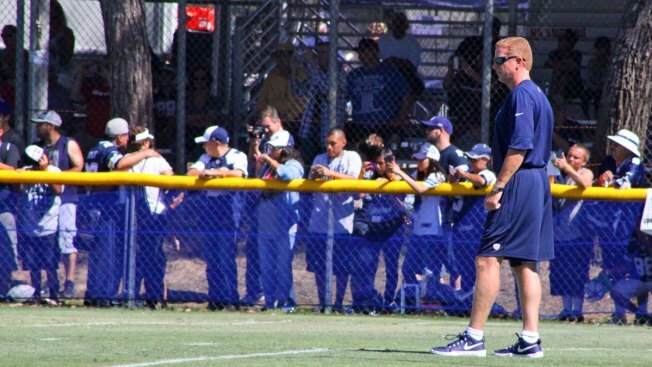 Whether he really was that miffed by the effort he saw on Saturday, or just wanted to light a fire under his players before their second padded practice on Sunday, Garrett offered a couple positives before laying into what he saw as a sloppy showing in Oxnard on Saturday. “I thought we worked hard,” Garrett said, per the Dallas Morning News. “I thought it was competitive. I thought it was spirited. Garrett then turned his attention to the team’s physicality--or the lack thereof.